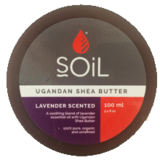 SOiL is a South African company producing certified organic products locally. We supplied SA’s first range of certified organic aromatherapy products. We are unique in that we farm, process and market our products. By owning most of that supply chain we are able to control and understand what determines the quality of our products. We are also actively involved in establishment and support of various projects which seek to uplift impoverished communities. Our brand provides a route to market for the products made by these communities. Lie back and let this luxurious bath oil with nourishing and anti-oxidant-rich coconut oil moisturise and protect the skin, while essential oils of grapefruit and lemongrass uplift and revive the senses. Soak for at least 10-15 minutes to get the full benefits of the aromatherapy oils. This candle, with a lead free wick, is long and clean burning, making it a better alternative for you and the environment. Soy wax is also a renewable resource and is biodegradable and water-soluble. Please note that due to the high essential oil content (6%) of the soy wax candles, they are not meant to be used as massage/moisturising candles.